The one looking stylish here would not be me, though I suppose that’s debatable. My sister resurrected this Kodak moment and gave me the faded jewel on my last birthday, no doubt to immortalize my six-pack abs. 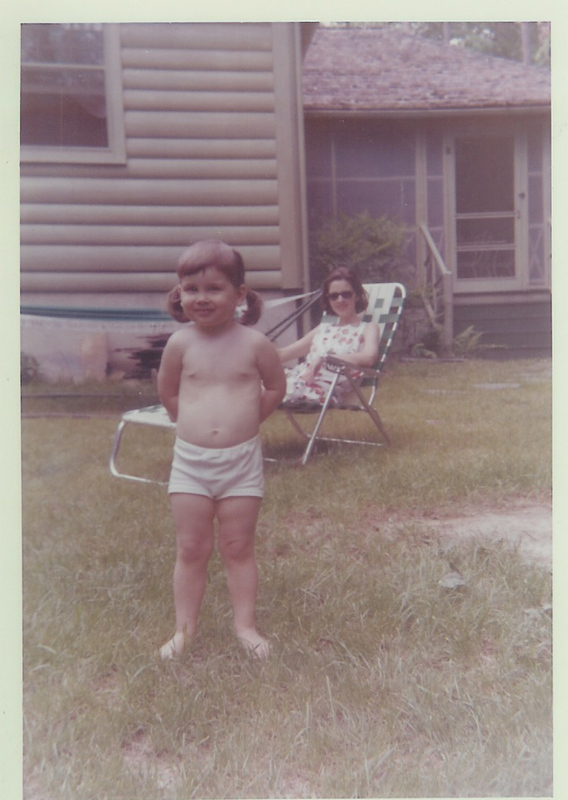 I love thumbing through childhood photos, oohing and ahhing over pudgy, unselfconscious innocence. But after having children of my own, I look at them differently now. I no longer hone in on cute knock-knees and chubby thighs; I focus on the background. I study the landscaping, the decor, notice books and ash trays on coffee tables, hunt for clues that conjure the past now that I can interpret it from an adult perspective. I see my parents — take note of what they’re wearing, how relaxed or happy or stressed they look, and try to imagine who they were back when they were younger than I am now, though that realization (how could they ever have been younger than I am? — they always seem more sophisticated than I ever will) never fully sinks in. And in every photo, mom always looks pulled together. Her hair neatly brushed and Aqua-Netted, her clothes tasteful and ironed. She is a woman of elegance, and even now, especially now, despite the fact that her mouth droops open and saliva doesn’t stay put, she defies the goddesses of mediocrity and sloppiness. She teaches me that beauty is more than skin or muscle or neuron deep. That elegance comes from fortitude, not fashion. That a little girl in pigtails might as well take on the world. Naked or not. ~ by Stephanie on 08/27/2010. Unbeatable: the picture, the girl, the story. She watches over you (with no doubt a bit of your own 2 year old drool). Now you watch over her, as she strips down to the bare essentials. Zelma Pattillo put me in touch with your web site. Beautiful. Your father was my teacher in Seminary and I always appreciated his gifts. I grieve for you all. But your gift must make him very proud. If Bert and Lucille are still around–give them my regards–I had Lucille’s father’s funeral in Clemson. I am just finding your comment – I apologize for not responding sooner. I’m grateful for your words, and your thoughts surrounding my father. Bert retired last May – he and Lucille are in England for a year where he is interim pastor of a church. I will give greeting when they return. Thanks for being in touch and responding to the blog. I so see you in that adorable photo, Stephanie, and your mother in the background looks serene. She passed that on to you, I think. I love this photo and your words, as always, are wise and beautiful and not a little heart-breaking.